Back after a gap, Recently i got a query asking me for selecting a better way to choose a pumping network, Whether to select Pumps in series or Pumps in parallel for the secondary pumps in chiller plants to pump into production blocks. And First of all i'm very happy to share my knowledge with you, and the second thing is its very great experience to receive such mail asking me, but as per regular explanation i'll go on explaining the basics first, and then i'll go deep explaining all those hidden tricks of selection a pump network. A Pump is something which uses the mechanical energy produced by a motor to convert into kinetic energy, simply a pump is used to create some pressure in direction opposite to gravitational force in a system. How to Select a Pump Capacity? For this query Read this post How to Select a Pump, Motor?? What are Pumps in parallel? Pumps in parallel is the way of connecting all the discharge ends of pump to one End, for this the coupling of the pumps must be perfect, otherwise this wont work efficiently. 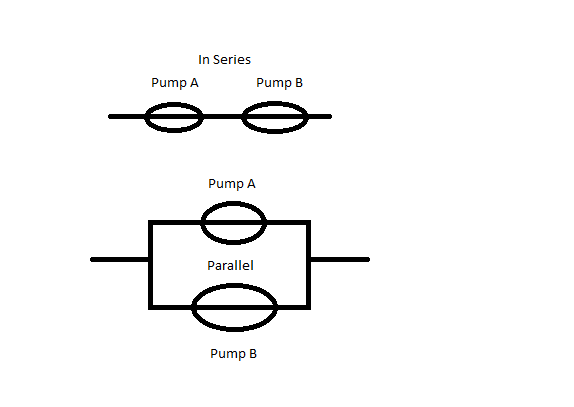 What are Pumps in Series? Pumps in series is the way of connecting the Discharge end of first pump is connected to the Suction End of second pump. So, Now you got the basics required and i'll explain you deeply what will happen with these arrangements. The Above Figure shows you how the pumps in series are arranged, and many of the project engineers will surely get confused over the difference between the pumps in series and pumps in parallel, but while designing a chiller plant if such confusion arises then the result will be unpredictable. As the major part of the chilling plant lies in the pumping of chilled water or brine to production blocks. What is Steam under Vacuum? When pumps are connected in series then the Head of those both pumps can be added, that means if you have two pumps P1 and P2 having flowrates as Q1 and Q2, Head as H1 and H2, then the Total possible head from these arrangement can be H = H1 + H2. In the above Case study, there were two pumps operating at 200 Cu.m/Hr, having different heads as 100 m and 200 m, then the overall head that would be developed by the pumps arrangement is series would be sum of 100m and 200m, i.e., 300m. Pumps while operating in series would develop other properties irrespective of heads, they will develop some excess flowrate when compared to them individually, Each pump develops the same head H at the corresponding capacity. Thus, the first pump at capacity Q1 develops the same head H as the second pump at capacity Q2. This commonality of head across parallel pumps is the most important feature of pumps installed in parallel. If the pump heads are not matched, pumps in parallel will not function properly. From this above figure, it will be clear that if the pumps are arranged in parallel, then the flowrate will be added as resultant, and the points were indicated representing 3 cases. while arranging pumps in parallel flow will add i.e q1+q2. But in case of series practically it is not possible .eg. 1 st pump connected with 2nd pump in parallel and 1st pump having head of 50 meter (say water than p=5kg/cm2),this 5kg/cm2 pressure will goes into the the suction side of 2nd pump at 5kg/cm2 and can damage the impeller. Just tell me whether u need to connect pump in parallel or series? ?